I love chocolate. I love sweets. I love anything made with suger, or even chocolate colored. One of my students gave me a box of truffles. I don't mind telling you I have always been confused by chocolate truffles, knowing full well that a truffle is a fungus that pigs dig up somewhere in France. (Ok, I'm right enough that we don't have to split hairs on that definition). So I have always wondered why delicious chocolate-y concoctions are named truffles, and in the back of my mind I have always wondered if I was in fact eating some fungus when indulging in these convections. Well when I don't know something, Matt usually helps me figure it out. My box of truffles, which I've come to learn cost about $50, is I guess, classy. It comes in this velvety box with a fancy magnet closure. It had a satin bow. I was impressed. Until I opened the box, and well, voila. For everyone who has paid $50 for this box and believed they were purchasing a classy gift, you've all been had. These are chocolate turds, not chocolate truffles and they ought be named that way. A little research divulges that these are intentionally made to look this way, a most unappealing of presentations. My sister Melissa, one for the obvious and a lover of all humor declasse, would have a field day with these. If you're interested, I'd be happy to make any of you turd-shaped goodies for half the price. I can make turd-shaped pudding molds! Or turd shaped brownies! Or maybe even a fig/date turd. $15 each for the descerning epicurian. In fact, I think my dog Amber may be able to get in on this. Note to self: I'd rather eat chocolatey turds. Technically that's not a truffle, that's a ill conceived mound of chocolate. Truffles are so named because their small, irregular shape mimics that of the actual truffle, not because they're related in any way. 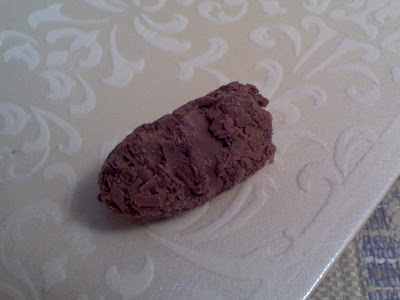 I always think truffles are a bit of a rip off, since they're chocolate covered candies without the covering. Truffles are what I make after I've dipped a few hundred candies.